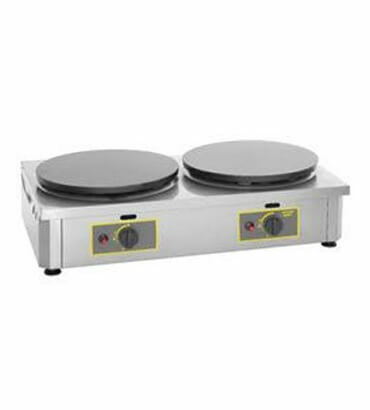 Roller Grill Crepe Machine Manufacturers in India, Roller Grill Crepe Machine Supplier in India, Roller Grill Crepe Machine in India. Roller Grill 400CDG in India has enamelled cast iron ensures even cooking, with minimum fat and no pre-seasoning necessary. Spiral elements, like star-shaped burners, distribute heat evenly, essential when it comes to making the perfect pancake. Drawer to keep warm dishes or pre-cooked crepes. Supplied with wooden spealer.